We are a one stop shop here in MPD dispatch. The girls and guy in dispatch work so hard. They dispatch on the police radio, fire radio, and send EMS all while still answering the phone calls that come in AND while taking bonds for the prisoners for our full service jail. We also have a full service window open to the public where they handle any question that may walk up and take items for prisoners in the jail, bonds, traffic ticket payments etc. 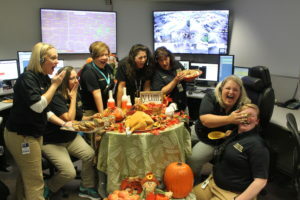 The dispatchers here do everything all at the same time. We don’t have call takers separate from radio dispatchers. They do it all. We stay busy. In 2018 our dispatchers answered and made 180,624 phone calls of which 44,966 were 911 calls. The police side took in over 40,000 calls for service and the fire/ems side took in over 12,249 calls for service. We usually only have 3 dispatchers to a shift. One on police radio, one on fire radio and one trying to do phones. All three have to answer phones even if they are dispatching on a radio. We also provide EMD instruction here which also adds on another layer. I care about my dispatchers very much and would love for them to receive lunch to show that I’m not the only one that appreciates them. We couldn’t function without them here at MPD.